Mellor set for Blackpool return? Blackpool boss Gary Bowyer has dropped his biggest hint yet that Kelvin Mellor could re-sign for the club. The defender’s contract at Bloomfield Road came to an end at the start of July but the free agent has yet to find a new employer. Bowyer has kept in touch with the 27-year-old, who made 89 appearances for the Seasiders in his two seasons at the club. Mellor, who signed for Pool from Plymouth Argyle in 2016, has been linked with moves to Championship sides Wigan Athletic and Blackburn Rovers. However, nothing has yet transpired despite there being just two weeks until the new Football League season starts. 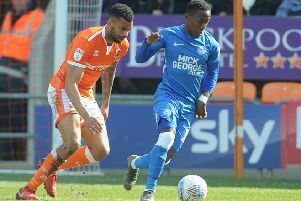 Bowyer, speaking after Blackpool’s 1-0 friendly win at Port Vale on Saturday, says he remains hopeful of seeing Mellor line up in tangerine once again next season. “We’ve still not given up with that one,” he said. “We’re trying to get something over the line, sooner rather than later would be nice. “I think he would find it frustrating himself (leaving it so late) knowing the lad well, but obviously he’s got a person that represents him and they will be trying to get him to the highest possible level they can. Following Saturday’s friendly double-header against Nantwich Town and Port Vale, the Seasiders are now turning their attention to tonight’s trip to AFC Fylde. Bowyer says the game, which will be Pool’s first appearance at Mill Farm, is all about progressing the fitness of his players ahead of the League One curtain raiser on August 4. “It’s all about getting the timings again and getting minutes in the legs. The most important thing about it is coming out with a fully fit squad,” Bowyer added. “We’ll expect a competitive game against AFC Fylde, for sure, in what is a local derby if you like. We knew about that when we were picking these games. Jimmy Ryan was missing for Pool’s game at Port Vale on Saturday after picking up a knock in last week’s behind-closed-doors friendly win against Burnley. However the midfielder, who took part in fitness work during the warm-up at Vale Park, isn’t expected to be out for too long. “It was just a bang on his knee from Tuesday,” Bowyer added.